All of our high quality concrete sealers and concrete cleaners are manufactured at an ISO 9001 certified facility. ISO 9001 is an Internationally recognized quality standard which measures the ability of a business to address customer requirements and satisfaction. The sealants offered on this page enable us to revamp existing ponds and make them beautifully clear even if they are built of concrete, mortar or limestone. 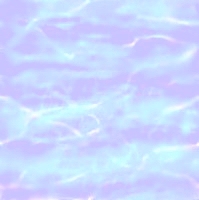 They are excellent products with other uses as well. See the algae page for more pond info. We offer application services for most projects. Call us at 817-293-1782 if you have any questions. Thank you. Click to add an item to your cart. You can always remove it later. Click More Info to view more specific information on a product. Thanks for visiting. Choose your product - Which Sealant is right for your application? At Everything Fishy, for pond work, we primarily use X-3, but all of these products are first rate. Be sure to click more info for more detailed information, access to msds, tds and label documents in a pdf format. Concrete Sealer X-1 is a permanent silicate based deep penetrating sealer which means that it is guaranteed to last for the life of your concrete because it chemically bonds to the concrete to become part of its integral structure. It is highly effective in making concrete physically stronger and denser while increasing its resistance to stains, acids, alkalis, moisture, mold and mildew. Concrete Sealer X-1 can be used in all commercial and residential applications to treat damp or wet basements, concrete floors, walls, driveways, garages, warehouses, storage tanks, pipes, blocks, grout, mortar and stucco. It can also be used to extend the life of exterior wood including fences, patios, decks, cedar and wood shingles. Concrete Sealer X-1�leaves a�natural finish (no sheen)�after application, it is UV resistant, non-yellowing, breathable�and the surface will not be slippery. This sealer is not a repellant coating so the concrete can be painted after it has been sealed with increased paint adhesion because the sealer neutralizes the alkalis in the concrete preventing saponification of the paint. Adhesives and epoxy coatings can also be applied over the sealed concrete with no adverse effects. Concrete Sealer X-1 is environmentally friendly, non-toxic and nonflammable because it does not contain chemical solvents or release any VOC or noxious fumes. After cementitious surfaces have been treated with Concrete Sealer X-1 or Concrete Sealer X-2 they can resist many chemical compounds more effectively including acids, salts, solvents, alcohols and oils as shown in this table. How much X-1 should you order? Typically a 5 gallon pail will seal a maxumim of 1,000 square feet of poured concrete using the two required applications(2,000 sq ft total) but this coverage can be lower depending on the porosity. 1640 1 Gallon bottle X-1 Concrete Sealer Price: $47.00. 1641 5 Gallon bucket X-1 Concrete Sealer Price: $154.00, free shipping*. 1642 55 Gallon plastic drum X-1 Concrete Sealer Price: $945.00, free shipping*. *Continental US only, 497 pounds delivered to a location with a loading dock. 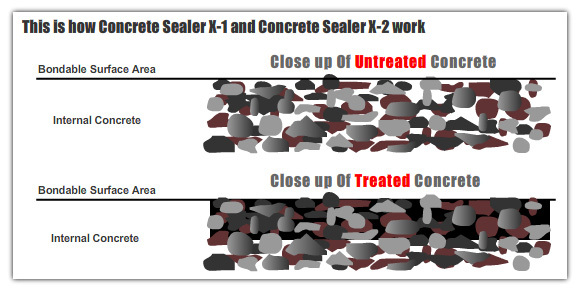 Concrete Sealer X-2 is a higher concentration product than Concrete Sealer X-1. It creates the same chemical reactions within the concrete as Concrete Sealer X-1 and it has the same physical properties, coverage rates and application procedures. Concrete Sealer X-2 has been specifically designed to seal very porous concrete or cinder blocks. This product is also recommended for poured concrete if the concrete is more than 10 years old or if signs of seepage or damage such as dusting and efflorescence are already evident. It is also recommended that this product is used on outdoor concrete surfaces which may be exposed to severe weather conditions. Concrete Sealer X-2�leaves a�natural finish (no sheen)�after application, it is UV resistant, non-yellowing, breathable�and the surface will not be slippery. This sealer is not a repellant coating so the concrete can be painted after it has been sealed with increased paint adhesion because the sealer neutralizes the alkalis in the concrete preventing saponification of the paint. Adhesives and epoxy coatings can also be applied over the sealed concrete with no adverse effects. Concrete Sealer X-2 is environmentally friendly, non-toxic and nonflammable because it does not contain chemical solvents or release any VOC or noxious fumes. Concrete Sealer X-2 is a ready to use, DIY type product which has a shelf life of at least two years. After cementitious surfaces have been treated with Concrete Sealer X-1 or Concrete Sealer X-2 they can resist many chemical compounds more effectively including acids, salts, solvents, alcohols and oils as shown in this table. 1643 1 Gallon bottle X-2 Concrete Sealer Price: $49.00. 1644 5 Gallon bucket X-2 Concrete Sealer Price: $174.00, free shipping*. 1645 55 Gallon plastic drum X-2 Concrete Sealer Price: $1145.00, free shipping*. *Continental US only, 510 pounds delivered to a location with a loading dock. Concrete Sealer X-3 is a special blend of polysiloxanes which crosslink below the surface of the concrete making the concrete surface water repellant and stain resistant. Concrete Sealer X-3 can be applied on all types of decorative and stained pavers, aggregate driveways and walkways, bricks, clay tiles, sandstone, limestone, marble, granite, slate and any natural stones. It can be used on above grade plaster and stucco, to seal swimming pools and fish ponds, in dog kennels and agricultural institutions. Concrete Sealer X-3 leaves a natural finish (no sheen) after application and the surface will not be slippery. Concrete Sealer X-3 has also been proven as an effective anti-graffitti barrier helping to prevent paints, aerosols and crayons from adhering to the wall and allowing easy removal if they do. Concrete Sealer X-3 is a ready to use product and does not require the addition of an activator which means that it does not have a limited pot life unlike some competitive products and it has a shelf life of at least 6 months. 1646 1 Gallon bottle X-3 Concrete Sealer Price: $67.00. 1647 5 Gallon bucket X-3 Concrete Sealer Price: $219.00, free shipping*. 1648 55 Gallon plastic drum X-3 Concrete Sealer Price: $1599.00, free shipping*. *Continental US only, 457 pounds delivered to a location with a loading dock. © 1999 - 2017 by Alice Burkhart.